A red London bus full of schoolchildren crosses Westminster Bridge when, suddenly, Pharoah and a phalanx of chariots and horsemen gallop by on the surface of the Thames itself. The bus whirls into the air and spins crazily down among the Egyptian host. And disappears. From that time on, nothing stays still for long. The plot slips through Time from past to future to present and back again, in and out of parallel worlds through Space, and plunges below ground, surfacing miles away and probably in a different century. If this demands agility from the reader, it also requires fine control from the author. The mood created is such that you feel Jeanette Winterson is having a really good time, playing with dialogue alive as electricity, messing about with magical and scientific notions of time, and weaving a tangled web indeed. Whenever I lost the plot, I was happy enough to clamber back on board and take the ride. 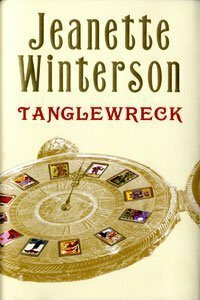 In short, and doing the plot no kind of justice at all, it’s about a lost clock called The Timekeeper which pretty well all the characters would like to get their hands on. As they have for hundreds of years. All the frenetic adventures begin and end with that.